NOW AVAILABLE: DCC Halloween Module, Star Crawl, Back to BasiX #6, and Other Third Party DCC Supplements! 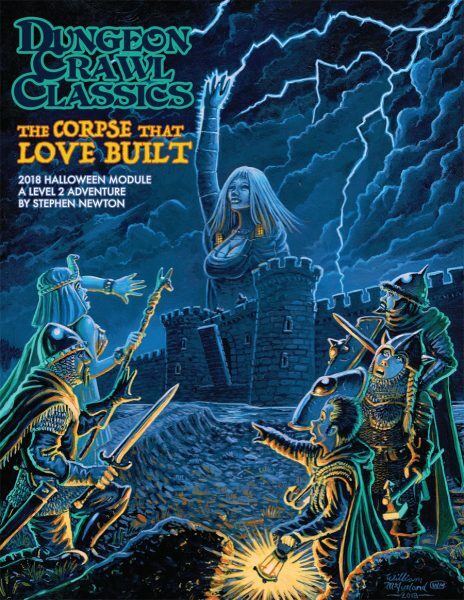 Home » Latest News » NOW AVAILABLE: DCC Halloween Module, Star Crawl, Back to BasiX #6, and Other Third Party DCC Supplements! If you think that headline is long, just wait until you see the list of the treasure trove of product that is available as of today! We’ve got everything from the anticipated DCC Halloween module for 2018 to a setting that will take your characters to the stars, and everything in between! And a lot of what is released today is from one of our third-party publishers. Don’t forget that whenever you order any third-party DCC product from our store, you get free DCC Monster Cards courtesy of Shield of Faith Studios. You can read all the details about the promotion here. In the meantime, we’ve got a TON of product for you. It’s a long list, so let’s get to it! Also available in a PDF-only version! 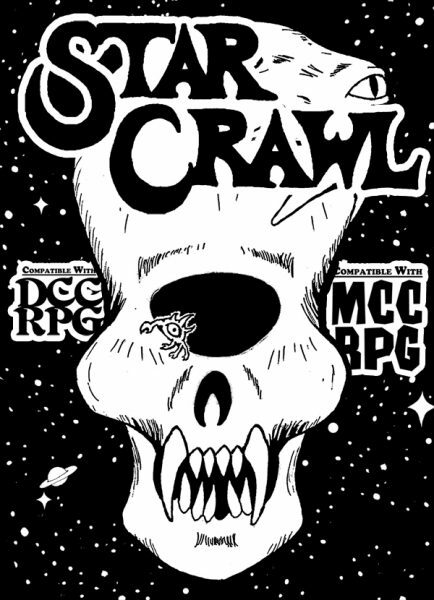 Star Crawl: Fantastic adventures in space and beyond! Ready to escape the shackles of terrestrial campaigns? Star Crawl is here to take your games across the cosmos! This full-size perfect bound book is packed to the gills with useful rules and tools for sci-fi gaming in the DCC style! Includes a full 0-level funnel: The Promethean Adventure! While features of this book can be applied to any game system, Star Crawl is designed for use with the Dungeon Crawl Classics and Mutant Crawl ClassicsRPGs. The sixth Issue September 2018) of the Back to BasiX fanzine, from Thom Wilson at ThrowiGames LLC. This fanzine celebrates, highlights and supports one of the original roleplaying game systems of the 1980’s, the Basic and Expert editions of Dungeons & Dragons. 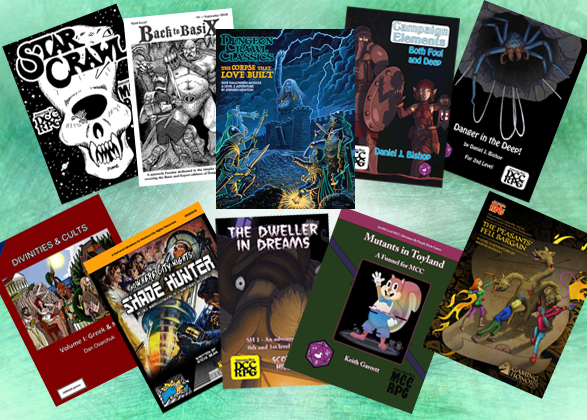 Each issue provides or highlights content within the Holmes, Moldvay, Cook, and Mentzer edited rules from TSR’s Gary Gygax. This issue contains: product spotlight, spell review, new magic items, new monsters, a short encounter (“Slime Chambers of Gebbellurd”), a full-page comic “Dungeon Delvers” (artist, Travis Hanson), and an interview with author Mike Carr. Appendix N literature is filled with cities, glorious or decaying. Beneath the streets of these urban centers lies a region dank, foul with the effluvia of countless generations, flowing through crumbling brickwork in the malodorous darkness. If your players are anything like mine, sooner or later they will wish to have their characters delve into these fetid morasses. This product is intended to ensure that you are ready. To that end, a small area of sewers is described, with several hooks to entice PCs into investigating. Three appendixes supply added content to expand the original area or to create sewers of your own. The last appendix is an abbreviated patron write-up of Squallas, Mistress of the Night Soil Rivers, whose domain is the sewers. 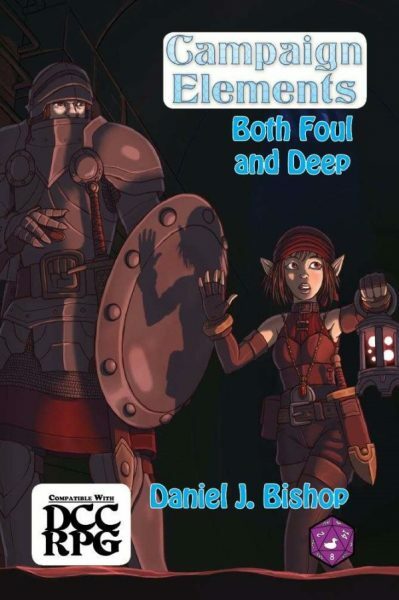 Campaign Elements 9: Both Foul and Deep written by Daniel J. Bishop, is a campaign element to designed for 4-6 level 1-2 PCs, with the tools to help you create a rich campaign environment for PCs of any level. There’s Danger in the Deep, and with it… treasure beyond imagining! Beneath the earth, where the sun is just a story recited from long ago… things… dwell, and covet their own treasures not known of on the lighted surface, dare you seek them and challenge… Danger in the Deep? 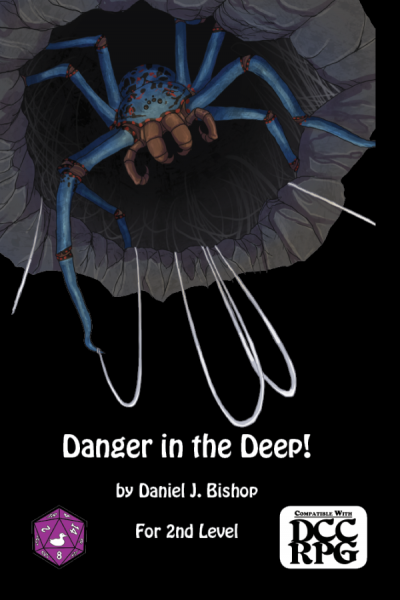 Danger in the Deep includes a detailed Judge’s map and a blank player’s map, room descriptions and loads of beautiful art depicting the strange denizens of the deeps. Appendices describe the new possible patron, Gul, the Old Darkness, and the amazing eternal artifacts, Cold Stone and Running Water, mysterious items for players to seek and discover their doom! 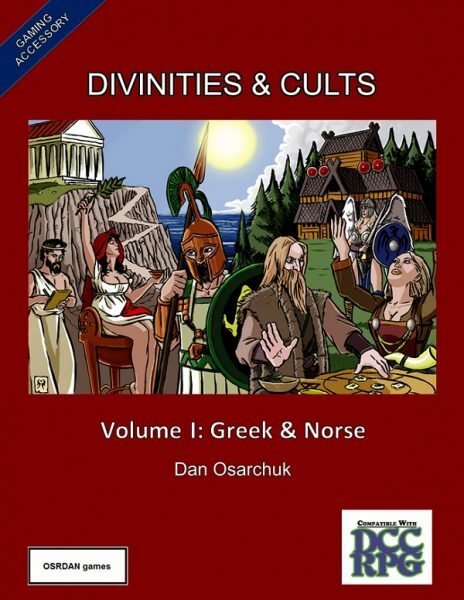 Divinities and Cults: Volume I covers the gods and goddesses of the Greek and Norse Pantheons, as well as a number of Evil Cults. It provides detailed tenets, special cleric considerations, magical side-effects, numerous divine tests, and custom spell lists for all 19 of them. What is more, optional rules and random tables abound, organized by divinity of course. 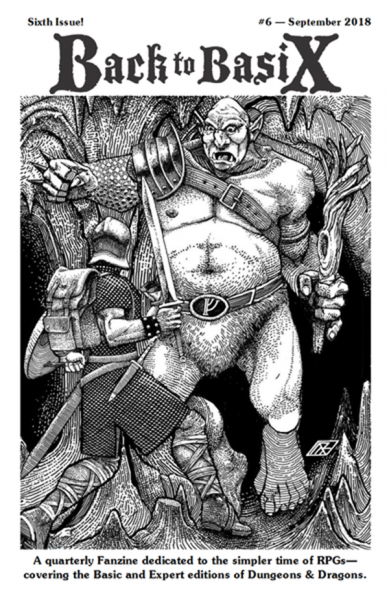 This excellent book is compatible with DCC RPG! Children’s rhymes, notes from beyond, mysteries and madness are waiting for you in the tiny hamlet of Ravenhollow, where a group of souls have been taken through time and space and left in the bodies of children, to face the peril of the Dweller in Dreams, a demon threatening the realms of all who would foolishly summon it. Dare you try to survive terrifying town, fearsome forest, and harrowing haunted house to defeat the demon Dweller and return to reality? 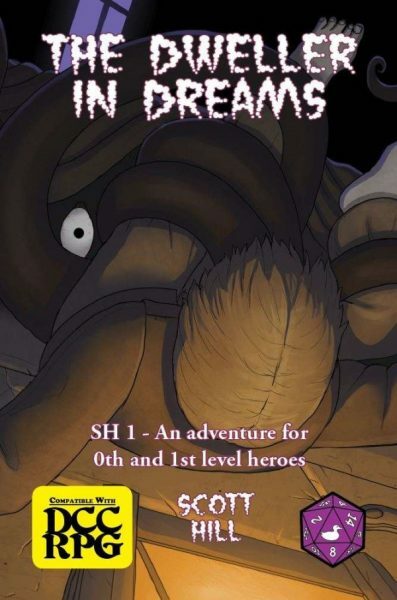 Then get hold of a copy of Scott Hill’s The Dweller in Dreams published by Purple Duck Games! 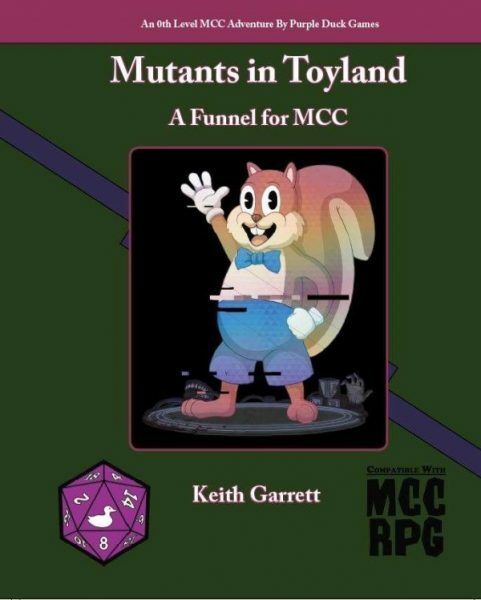 This Dungeon Crawl Classics compatible adventure is a 0-level funnel for 12-16 beginning would-be characters, and contains all that you need to play. Full-color maps and innovative art, detailed area descriptions for player characters to explore, and a full appendix on a terrifying new Patron for players to ally with—the diabolical Dweller in Dreams! So if you want to thin the herd and explore the dimension of children’s nightmares, then get SH 1: The Dweller in Dreams from the phantasmal phobics at Purple Duck Games—where our games are what you want! Well hey there, kids! I’m Sammy Squirrel! Gosh, it feels like I’ve slept for ages! Now that I’m awake again, I hope you’ll come on down and check out Sammy Squirrel’s Smart Toys! And by “down” I mean underground, through this mysterious hole! Because my toy store has been buried for centuries, and all the fun down here is just aching to get out again! Here at Sammy’s, we don’t mind at all if you have an extra arm or two or you have roots for feet or you’re not quite housebroken. All kids are welcome, so long as you like having fun! Sure, I’ll admit that my store has seen better days. Some of the lights flicker, and a few walls have fallen down, and then there’s that problem we have with some of the toys trying to people. But better days are coming, and lately we’ve been attracting customers from far away. Far away indeed. Lord Stenorian promises incredible rewards to find his son, but will you keep the bargain when you learn the truth? For generations your village struggled to survive in the shadow of the distant Stenorian estate. Now raiders have overrun the ancient keep, and the lord and the lady of the manor come pleading for your help. The mighty Lord Stenorian offers you a deal too good to be true: find his son, hiding somewhere in the house, and he will use his supernatural power to reward you beyond your wildest dreams. But the Stenorian manor holds secrets kept for centuries, and horrors you cannot imagine. When you learn the truth, will you keep your half of the fell bargain? 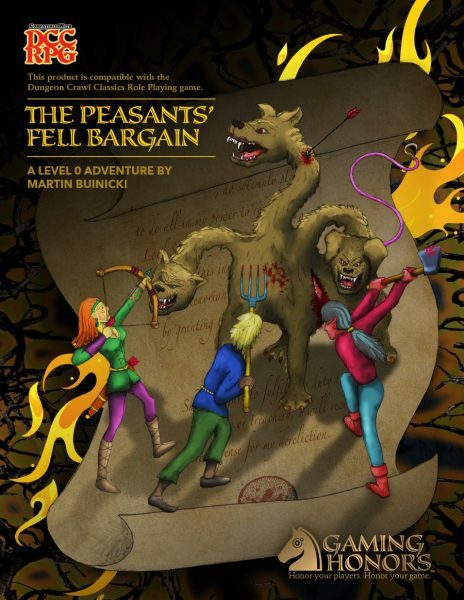 The Peasants’ Fell Bargain is an original Dungeon Crawl Classics compatible 0-Level funnel adventure, inspired by classic tales of horror and the original master of the macabre, Edgar Allan Poe. The module features 28-pages of adventure, illustrations, handouts, and game supplements, including “Encounter Cards” that judges can photocopy, cut out, and use to run combats. In modern, sorcery-noir, “Nowhere City,” your adventurers investigate a crime spree by perpetrators who are identical to their victims! Shade Hunter is a Blade Runner-inspired adventure that throws your 2nd-level Nowhere City Nights PCs into the investigation a spate of violent crimes with an odd twist: eyewitnesses swear that the perpetrators of the crimes could be the identical twins of their victims! Someone, or something, is behind it all, but this is Nowhere City – so the list of possible suspects is endless. The city has so many corrupt politicians, greedy corporations and crooked cops that it’s rotted through. And operating in secret, behind it all, are the sorcerer cults that control the rest of the scum as if they were pawns on a chessboard. Do your PCs have the guns and the guts to get to the bottom of things? Secret truths about the world of Nowhere City Nightsawait adventurers with the grit to drag these secrets out of the shadows! Shade Hunter is chock-full of 44 pages of pulp action! It contains a 30-page adventure, a new Private Detective class, new rules for Investigation Skills and a new Nowhere City Nights Patron. 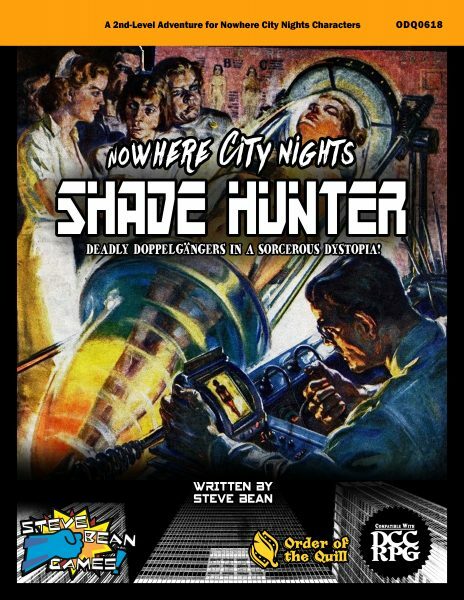 Shade Hunter was written by DCC veteran writer Steve Bean and co-published with storied DCC 3PP Publisher Order of the Quill press. That’s a LOT of new product! And it’s all in our online store right now! And it bears repeating: If you order any DCC (or MCC!) Third-Party Product, you will get free DCC Monster Cards courtesy of Shield of Faith Studios! So head on over to our online store and get yourself some great new books and some cool cards to boot!